Hi Helen, thank you for checking that out, it is a bit of a mystery; it was definitely near the Grove, but not as far down as Grove playing fields, I'm sure. It felt like it was in a row of shops, not on its own. My memory is of somewhere not quaint and twee, but of something pretty stripped down and utilitarian. I was scared I might get the hot water treatment too, and was wary of the cups and teapot! I can't recall the bakery (when did it close down, maybe this is what I'm thinking of?) or Whitesides, but your hardware shop near Penguins (god I loved it in there too, always angling for a bar of chocolate and some coloured pencils, usually in vain!) rings a vague bell, like you. Would that be where the old garage was previously, just before the bend for Fortwilliam arches? My teacher in Lowwood was Mrs Greer, and there's a couple of people of the same surname on the Belfast pics Facebook page; I wasn't aware that the surname was fairly common in NI. I hadn't heard of the window box manufacturer, presumably it was to the rear and side of what became the garage; I don't recall a side entrance when we lived there, maybe it had been walled up. On the shop front again, I have a memory of walking with my mother out of our front door and along the road to a butchers and possibly greengrocers, but on the same side of Shore Rd, so across from Penguins. My mum saved up weekly for the Christmas meat and bird at the butchers. Maybe it's all a fever dream, or the vagaries of our memories forty plus years out? So S.C.M. was probably State Certified Midwife. F.U.N.E.M.N.X. -----"Have you any ham and eggs?" I'd love someone to come forward about this one, Margaret, and hope that someone can shed light on it. The butcher's shop you speak of might have been the one at the corner of York Drive. My own Grandfather had a fruit and vegetable shop next to it, but not in our day. I remember going into the middle of those three shops for those "Perry/Perrie" crisps at 1.5p a bag as it was a newsagent's at that time, then into Pat and Olive's children's clothes shop to be kitted out in some embarrassing gear. That was one hell of a shop. It was bulging at the seams with stuff in long drawers, and elderly women though they were, they were nipping up ladders like greased lighteneing to open the drawers to retrieve something unacceptable. I think the hardware shop was just beyond the Penguin in another retail premises which is still there (I think). In some of my 1990/91 photo's on the thread it might be an estae agent's place. The Willowfield went some time in the 70s and I'm inclined to think the mid 70s. Well, we always wonder years on did that really happen? or have I grafted the memory on in some way? I think a lot of it is genuine, but I must admit that one or two or more of my memories seem too incredible to have actually happened. I've awlays fancied going to hypnosis to retrieve more memories but I haven't the nerve for that. A guy I know went and returned with a strange memory of having opened the front-door of his house as a kid in the middle of the night to an unknown woman. He said he felt he didn't know how he'd got to the front-door or who the woman was, but it left him with a vague apprehension about it all. Hopefully the response would be S. V.F.M.N.X. I think it might have been "9, V F Nt N E M N X." When you look on internet sites, some people say the Two Ronnies are now dated, but anyone who doesn't like the "4 CANDLES/FORK HANDLES" sketch must be mad. Ronnie Corbett slowly losing the rag is hilarious. Cheers for that CMcG. View from 1st cave many years ago, you can see what looks like a steam train in the distance trundling along. 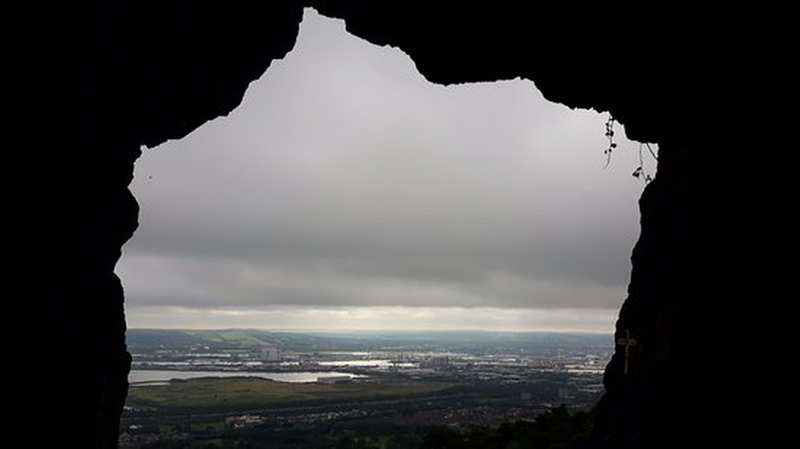 View from the same cave. ? when I was over in the late 90s I had breakfast in a small cafe, just past the Whitewell road turnoff on the left hand side of Shore Road, poached egg on farls never tasted so good. "Miss Martha McCloy (centre), Shore Road, Belfast, who was the first captain of the 44th Belfast Girl Guide company (Alexandra Presbyterian church), which was formed 50 years ago, is helped by the present Guide Guider (Captain), Mrs Mary Copeland, to cut the company's golden anniversary cake. A special get-together was held for past and present members in the church hall. " Keep going, Margaret. I like your find. So what is the real story behind all the destruction, vandalism and outright neglect of the Shore Road? I don't know, but maybe only a nuance can inform now in this strange, strange world we live in. Good luck to all.